A four-piece pop band from Canada, Sloan proves that good things do come from the often ignored country. 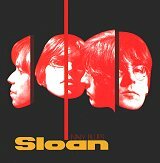 Paying homage to The Beatles, as well as the likes of AC/DC on a few tracks, Sloan's pop sound is both innovative and catchy. Progressing throughout the album, one minute they have you bouncing around on a guitar-driven, hooked-filled number, and the next minute they allow you space to rock out. Keeping each song bouncy and melodic, they still manage to keep themselves out of a ditch and serve up a refreshing cut track after track. Bouncy, hooky, and tremendously infectious from the get go, "She Says What She Means" starts this album off with some hip-shakin' melodies that will deliver a solid knockout punch without even looking. The guitars combine cocky metal riffs so common throughout the 80's with a splash of 60's Brit-pop. Blended together with a rock 'n' roll sensation, the guitars truly are the driving force for this number. However, percussion plays a big portion as well. The cymbals help re-enforce the well-crafted hooks, while the drums help put some more meat in the metal feel. But don't think of this as a '80's revisited' number, because it's not. They keep the pop out in the front and conceal the metal as best as they can, allowing it to only show it's face when they really want to wreck havoc. Let the bass march in with its ample contribution to the rhythm section and you have a solid opener that will make your mouth water and leave you craving more. Boy do they ever deliver too, the album just keeps getting better and better. "Iggy & Angus" shows the band in their best form, without the metal and in pure pleasure-pop mode. Solid vocal contributions start the song off great, while the hearty appetite of the drums keep the spirit alive. The guitars weave between power-pop chords and sugary hooks, all the while the bass beats like the heart of the song. Together they pay tribute to the early British-pop influences that dominant them, while also forging ahead and creating their own pop mayhem. "Keep On Thinkin'" keeps the charge that seems to burst out through the earlier tracks, but they also help elevate the energy level by dropping the intensity a bit and getting soft before lifting off and slamming another hook in your face. A great number that will get you more than bobbin' your head, you'll be shimming and shaking along with every note. An addictive roller coaster you wont want to get off, even after the track is over the memory remains as you try to focus on the next track while the previous one is still stuck in your head. "Seems So Heavy" uses the piano as its weapon of choice. Switching between brick-like notes and gentle strokes on the piano, the song is able to maintain an edge while still taking on a softer pop approach. The craft work on this number is genius-like. The verses seem mediocre at first, but when the unforgettable chorus pops in everything falls together and the song really seems to take shape. The album standout, by far, has to be "Chester The Molester." A dancing piano not only gets your feet tappin', but your whole body moving. The song sometimes slips in some child-like rhymes, but the follow through is amazing both musically and lyrically, so all is forgotten. Too many hooks to count, this number will take you by storm and you'll never look back. The topic seems like a tough one to swallow just by the title, but once you listen to the lyrics and begin to get a feel for the song you see everything in a different light. Open to many different interpretations, this song alone has the potential to at least get you listening a few more times. "On The Horizon" helps push that metal feel back into their pop sensibility. The result is a straight-forward rock 'n' roll track that is equal parts fun and energy. Closing out with "I'm Not Through With You Yet," they decide to end it all with an acoustic number that is very soft and melodic, but represents the appropriate close to a very tight, open-minded album. Sloan definitely has the energy, hooks, and even the looks to go far. Their songs are crafty and smart, getting stuck in your head within the first few seconds of each. NAVY BLUES is strong from every angle, with flaws that only help re-energize the band. I'll give this disc an A+. Slipknot: Slipknot Slobber/R.W.S. : Split 7"